Delivering Beers Hand Over Wrist! Since May 2013, we’ve partnered with our friends at Ignite in Newcastle, England, to run an event for startups, developers, tech watchers, entrepreneurs, and investors every month called Startup Beers. Recently, the Ignite team partnered with UKTI to run an accelerator programme in the newly opened Campus North. The 3-month-long Sirius programme was open to anyone who had gained their degree outside of the UK and wanted to accelerate their idea within the confines of the UK tech scene. After being asked to mentor on the programme, I was extremely interested in one company in particular – SunEos, two French entrepreneurs with a plan to bring cashless payments into the world of events using NFC technology. With a background in the music industry and events, I saw immediate applications for this for events and beyond. More than anything else, I wanted to see it in action. I decided that we could do a trial run of their tech at an upcoming Startup Beers event. We would provide the usual: the space, the funds, and the people. SunEos would provide SendGrid-branded, NFC-enabled wristbands that, when tapped on the back of a Nexus 7, would register their drink—replacing the usual token system we had used previously. Their technology is comprised of a tablet-based EPOS (Electronic Point of Sale) system and as many NFC-enabled items as you want—we chose wristbands, but cards, and other items can also be used. 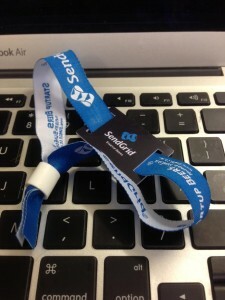 At the event, every guest was issued a wristband with a certain number of uses assigned to it. Each time they ordered a drink the staff had them tap on the back of the tablet with their wrist and the transaction was complete. The wristband was easily as quick as the usual token-based approach we had been using up to that point. One great example of why this was better than tokens became apparent at a point in the evening when there was still money left behind the bar, but most people had used their “allowance” already. With a couple of taps on his phone, Paco recharged everybody’s wristband with another credit. Boom—instant round for everyone, without having to hand out more tokens. Superb. Not only was it something different for people to try out, but they all left with SendGrid strapped to their wrist as a little reminder of who bought their idea-lubricating beverages that evening. This was a great opportunity to bring a (now) Newcastle-based startup into a regular Newcastle event to showcase their tech (on Sirius graduation day too) with real-world customer demands (from me). The team of Henry, Alexis, and recent addition Paco did a fantastic job. 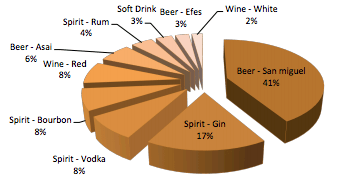 The best part of doing this event with SunEos was that they were then able to make me a report, post event, that details the frequency of drinks bought, type of drinks and, should I wish to dig in really deeply, who bought them. With this information we could actually start to build out a picture of how many beers I bought someone before they became a SendGrid customer, a Beers Per Acquisition metric if you will. Stick that in your Salesforce! Very cool technology and I look forward to figuring out ways we can better use this in future.